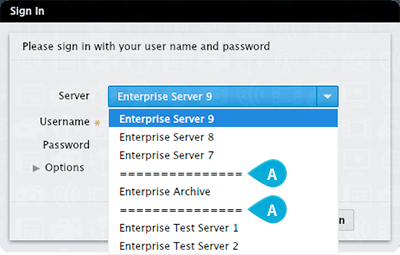 In order for a user to work on the files in Enterprise Server using Content Station, Smart Connection or Smart Mover, they need to log in to an instance of Enterprise Server. They do this by choosing a Server from the Server list in the Sign In window. When this list becomes very long, it may be difficult for users to find the Server that they want to log in to. To increase the readability of the list, separators can be added. Figure: A list of Servers, divided by separators (A). Tip: Group together Servers of the same type (such as various production servers, test servers and so on), and divide them by placing separators between each group. The separators are added to the list of Servers in the WWSettings.xml file.